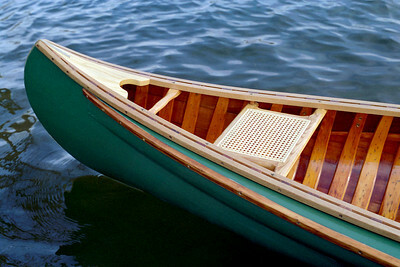 Here are some canoes and paddles I have built. 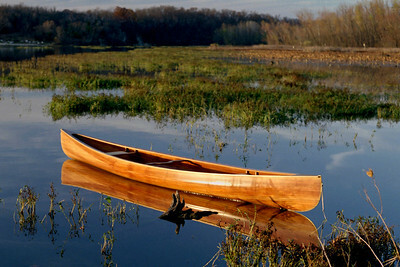 These are not kit boats - I start with purchased plans and raw materials - lumber, epoxy and fiberglass cloth. I have tried to give credit to the designers who created the plans, where known. 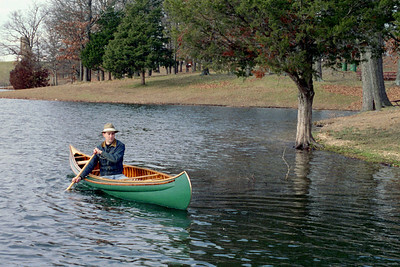 17.5 cedar stripper This cedar strip canoe is 17.5 ft long, about 34-35 inches wide, and weighs about 65 lbs. 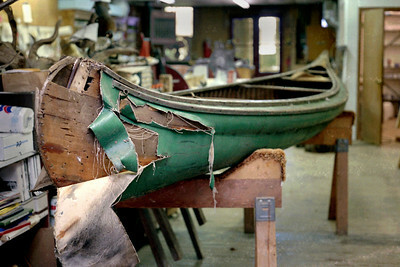 Old Town sold the plans along with a thin book titled "How To Build the Cedar Strip Canoe". While not given credit by Old Town, the builder in the book looks very much like David Hazen, author of "The Stripper's Guide to Canoe-building". 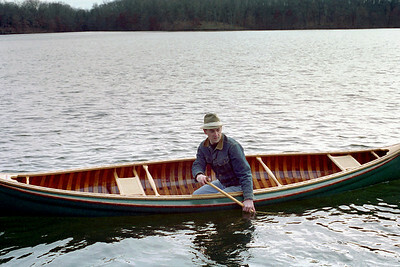 Snowshoe12 Ultralight Canoe - Gary Did I mention these boats are light? 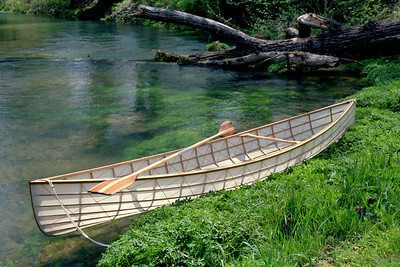 I stretched this canoe from the 12 ft design. 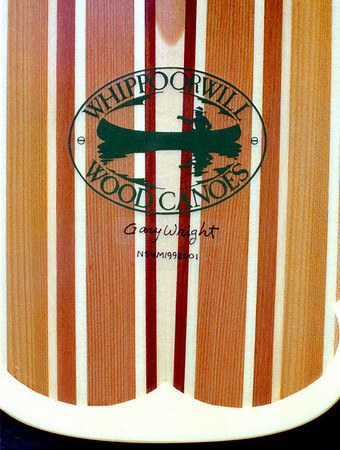 This boat was built for display purposes, only - a prop at Big Cedar Lodge in Branson - so I omitted the Kevlar roving. 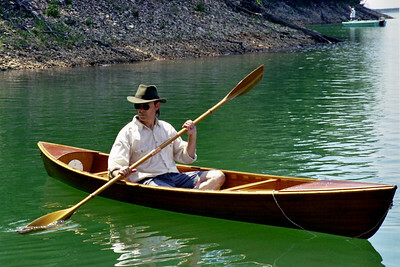 Snowshoe12 Ultralight Canoe A gunkholers delight. WeeRob13.5 - Seat Detail2 Details of the seat hinge. The cherry is lovely. It was light pink when new, but has mellowed to the rich color you see here. Canoe Paddle2b The paddle tips (white on this one) are a mixture of epoxy with various fillers to provide very effective protection against wear and impact. 1941 Old Town, after 350 hours of restoration. 17.5 cedar stripper2 Another view of the boat built from the Old Town plans. I spent a little over 200 hours on building this one. Snowshoe12 and Double-blade Paddle This was my first attempt at making a double paddle. The blades are slightly "spooned" (concave) on the working face. 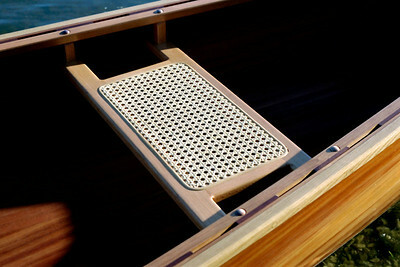 The paddle is made in two pieces joined by friction-fit copper fittings. The two halves are much easier to haul around. 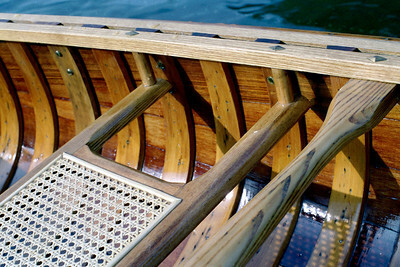 The fitting also allows the blades to be angled to each other so when the down blade is flat to the water, the up-blade slices through the air, edgewise - a benefit when paddling into the wind. Because it takes a little technique to master this arrangement, sometimes it's easier to just set the blades parallel. The copper fittings are made for plumbers, not paddlers, and are less than ideal because there is a little play in the joint (annoying). On later paddles I used a longer piece of aircraft aluminum which worked better and was also lighter. WeeRob13.5 This solo cedar stripper is 13.5 ft long and weighs about 45 lbs. 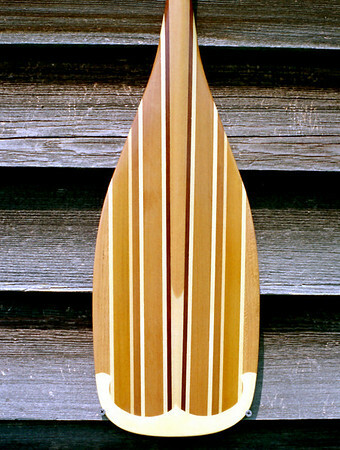 Designed by Iain Oughtred and customized during construction. WeeRob13.5 - Deck Detail An air tight chamber under the deck provides floatation and dry storage. The center piece of the plastic deck plate unscrews for access to the flotation chamber - handy for keeping a camera or sandwich dry. 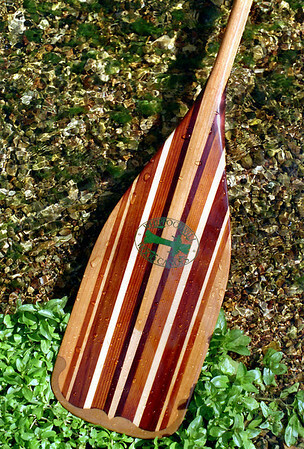 Canoe Paddle - T grip Some performance oriented paddlers prefer the T-style grip. 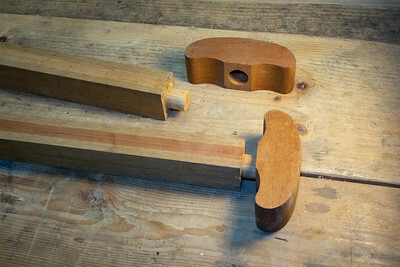 I use a mortise and tenon joint to attach the grip to the shaft. Old Town deck, before This kind stem and deck of rot is typical of wooden boats which are stored upside down on the ground. Don't do that!! 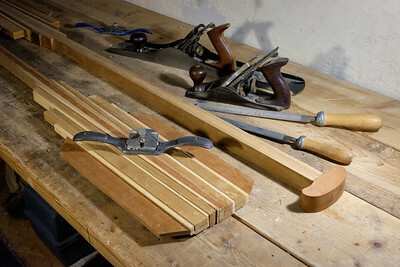 Canoe paddle detail; getting ready to glue on the T-grips. 17.5 cedar stripper - deck detail The deck is ash and walnut. 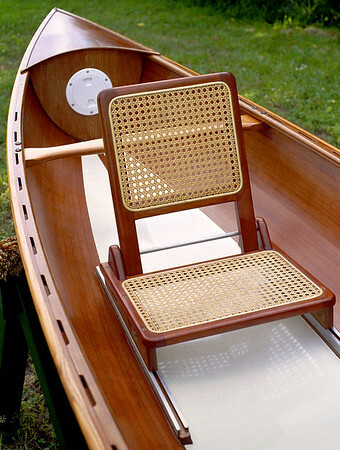 Some old time boat builders say it is bad luck to use walnut in a boat. 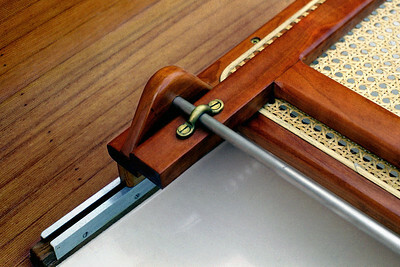 You can see the brass stem band and the bronze eyelet provided for tying on a line. 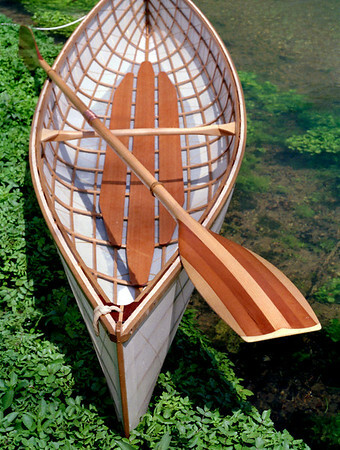 Snowshoe12 Ultralight Canoe - Deck Detail This deck is a little more elegant than what the plans indicate. 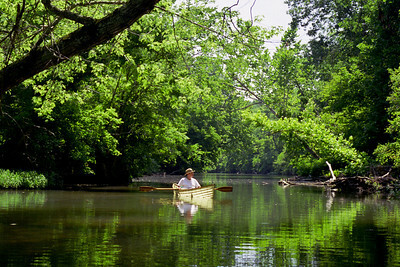 WeeRob13.5-Gary When I use the solo canoes on open water I prefer the double paddle, but in tight places I switch to a single blade. 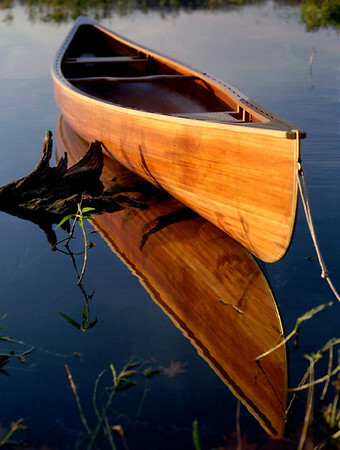 Canoe Paddle1 My wood paddles are laminated from hard and softwoods, then carved to shape. The blades are wrapped with a light layer of fiberglass cloth set in epoxy resin. Synthetic tips provide impact protection. Total weight usually comes in around 1.5 lbs. 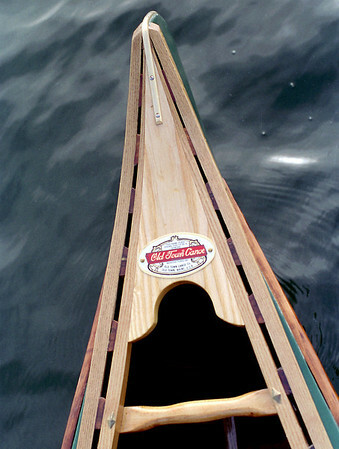 I try to balance the paddles at the lower hand position for better handling. 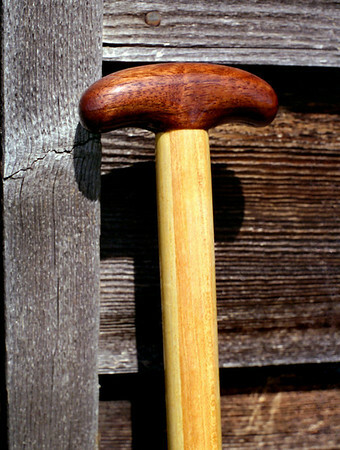 Canoe Paddle - Modified grip Here I have tried to merge the traditional "palm" or "pear" grip with the more technical "T" style of grip. 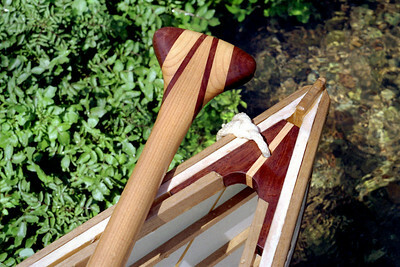 Canoe paddles, detail showing lamination before shaping. 17.5 cedar stripper - seat detail Seat is home built from cherry and hung from the inwales with silicon bronze bolts. 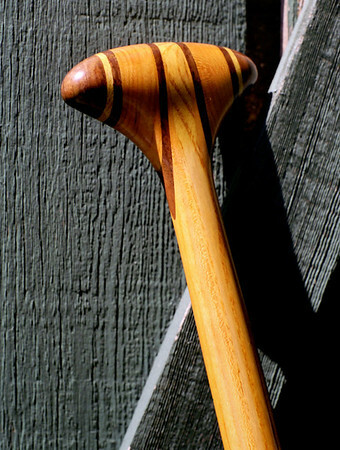 Factory woven cane is secured by a spline in a routed groove. Outwales are sassafras, inwales are cherry. 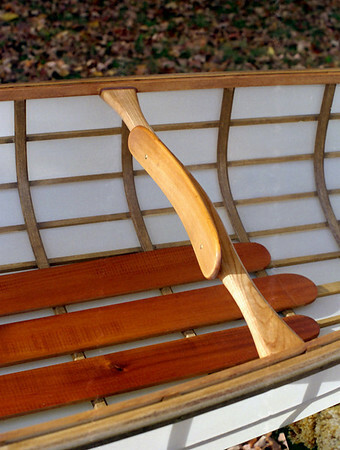 Snowshoe12 Ultralight Canoe - Thwart Detail A boat cushion on the floor boards and this carved thwart for a back rest makes a very simple seating arrangement. 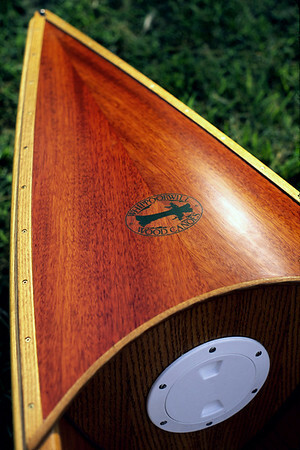 The curved panel back rest is a custom touch. WeeRob13.5-Rita What is better than messing around in boats? 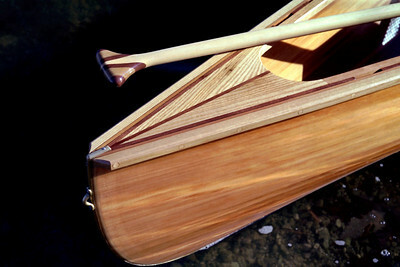 Canoe Paddle1b The dark wood is western red cedar and the lighter wood is mostly sitka spruce. My logo - designed by my brother, David Wright - is silkscreened on rice paper under the fibergglass which encapsulates the blade. 16' 1941 Old Town Sure, I'm smiling now, but this boat caused me a lot of pain. It came very close to ending up in the kindling box. 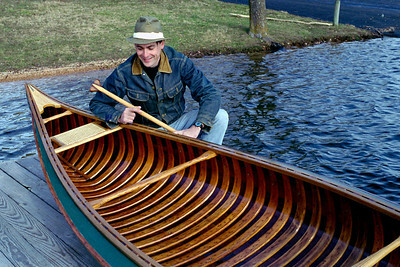 No, I didn't build it - but with the same time and money it took me to restore it I could have built two new canoes. 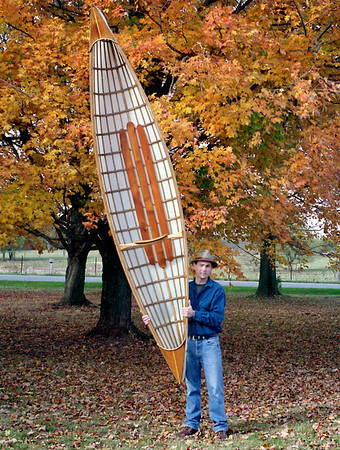 Snowshoe12 Ultralight Canoe This fully functional 12 ft solo canoe weighs only 14 lbs! 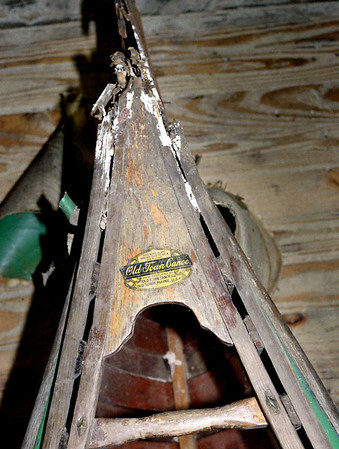 The light wooden frame is triangulated with Kevlar roving, then covered with Dacron. 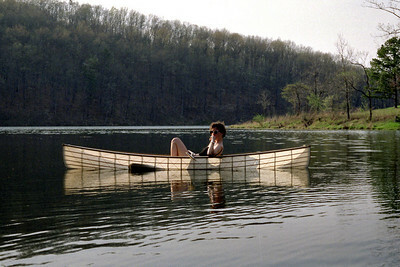 The designer, Platt Monfort, calls this building method Geodesic Airolite construction - http://gaboats.com/ It takes me about 80 hours to build one of these. The woodworking is low stress - like building a giant model airplane - and material costs are moderate. Platt Monfort calls this model the SnowShoe 12. 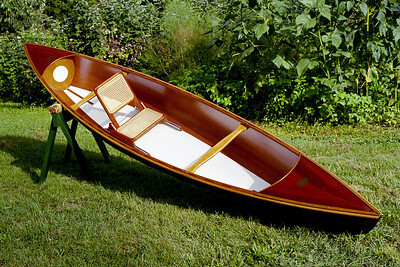 Snowshoe12 Ultralight Canoe - Rita These are sweet boats and a ton of fun! Rita was getting ready to load this one on top of our truck when a gentleman came running over to help her. He sure was surprised when she effortlessly lifted the whole 14 pounds all by herself! WeeRob13.5 - Seat Detail The seat adjusts fore and aft on aluminum tracks, and can be easily removed for use as a camp chair. The backrest folds down for transport. 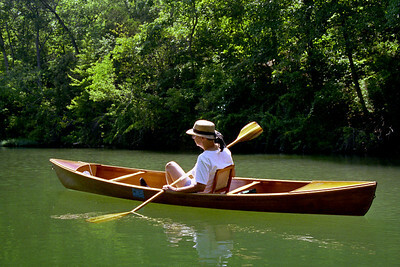 Canoe Paddle2 I always use hardwood for the edges of the blades, here sassafras. 1941 Old Town, before Needs a little work. 16' 1941 Old Town This HW model offered sponsons as an option. They provide extra flotation at the gunnels to resist rollover. This day was a bit too cold for me to test them as thoroughly as I would have liked.